Jerry Bissegger and Ross Peterson, May 21, 2017. 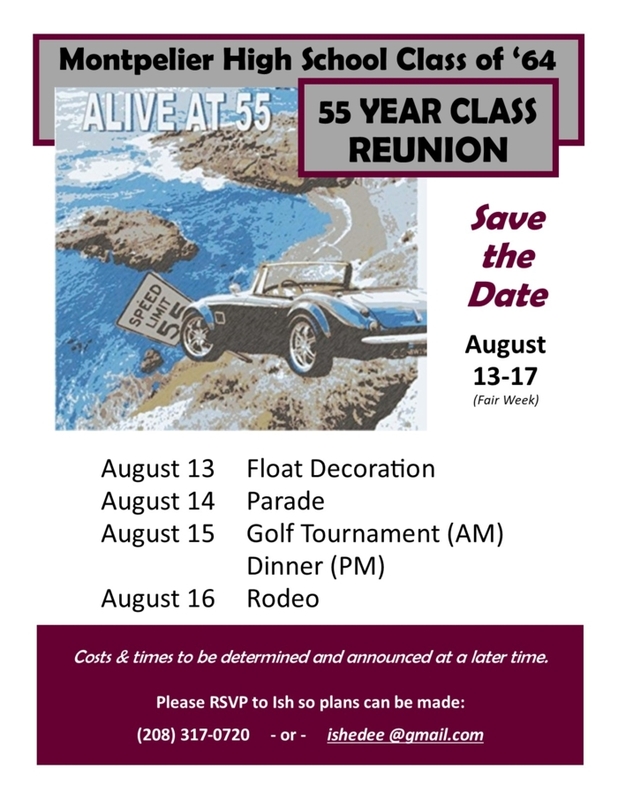 MHS class of 1959. Lynn Roderick provided the following history of the origins of Montpelier High School. Montpelier High School had its beginning in the basement of Washington School located on the northeast corner of 4th and Clay. The first high school class was organized in 1906 with Fred L Willis as the Superintendent. Eleven students were enrolled in the first year. They were Jennie Barrett, Finch Ridd, Myrtle Conley, Mabel Pearce, Marguerite Whitman, Harold Toomer, Cecil Hull, Earl Jonley, Forest Stuart, Neil Gee, Raymond Reese and Mildred Whiteman. Morning sessions were devoted to high school work which met in the one basement room of Washington School. Courses were the same for everyone, Algebra, English and Literature, Ancient History and Physical Geography. All eleven students completed the first year course. By 1906 a building was under construction which was being built on the playground area of what is now A J Winters Elementary school, adjacent to the Purple Sage property. High school classes continued to meet at the Washington School during the second year, but two rooms were then needed to house the students. Carl F Banghart served as superintendent, principal and instructor, with another teacher Miss Lois V Stoddard. There were 25 freshmen and ten of the original group as sophomores. This year the students choose the colors, banners and the Bear mascot. At the beginning of the third year students moved into the new building. The faculty included H S Stevens as principal and Georgia Bassett and Harold Sanders as teachers. Only five original students remained in the junior year, Mabel Pearce, Jennie Barrett, Neil Gee, Raymond Reese and Mildred Whitman. By the fourth year the building was completed and the student body was at 48. Only two Mabel Pearce and Mildred Whitman were in the senior class. These two received their diplomas in the spring of 1910. 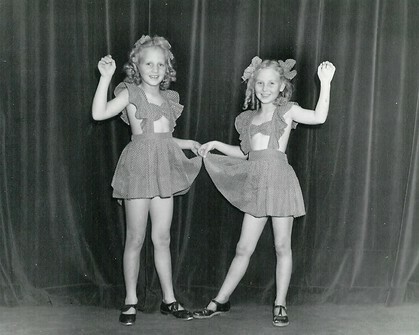 Both had identical grades and graduation was held in the Montpelier Theatre. Rev James Laughlin, pastor of the Methodist Church presided and Dean Elliott, President of the University of Idaho was the keynote speaker. 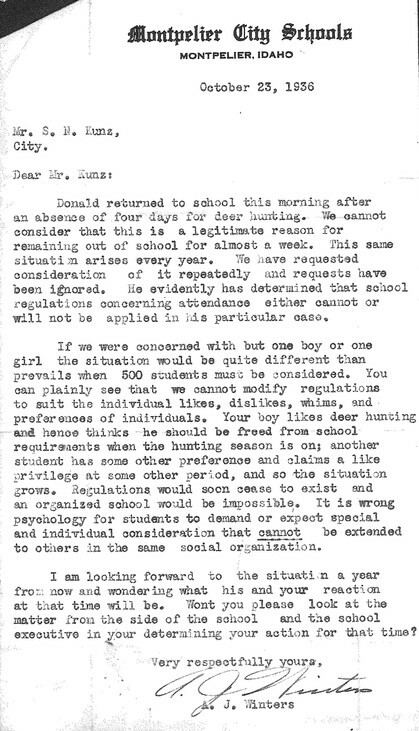 Ann Kunz Anderson shared this letter that AJ Winters wrote to her grandfather, SN Kunz, regarding Ann's father taking time off from school to hunt deer. 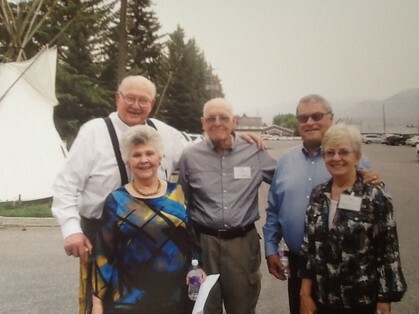 Ann's father is Donald Kunz, a graduate of the MHS class of 1938. Ann is a graduate of the MHS class of 1961. "Have you ever really had a teacher? One who saw you as a raw but precious thing, a jewel that, with wisdom, could be polished to a proud shine? If you are lucky enough to find your way to such teachers, you will always find your way back. Sometimes it is only in your head. Sometimes it is right alongside their beds." Ross Peterson quoting from Mitch Albom's "Tuesdays with Morrie." Mitch Albom had been a student of Prof. Morrie Schwarz at Brandies. Schwarz was diagnosed with ALS and they met on Tuesdays for many months until the professor died. Peppettes Circa 1958 Lion's Club Fund Raiser "Catch That Tiger"